I had one of the most energizing client negotiations of my career recently. It wasn’t a Fortune 500 marketing VP wanting to work with us. It wasn’t even a regional brand that I recognized. It was a small time retail company that had almost no online presence and very little track record. After the initial call, I was skeptical. Would they have the budget? Should I spend time on a proposal when, chances are, they would be scared away by price? Instead of expecting the worst, I stuck with it. I entered the next call with an open mind. A second call turned into a third, and third into a fourth. I pulled my strategy team in to look at the competition and market potential. The conversation evolved into something I never expected. Why Was This Conversation So Energizing? The conversation was honest and transparent. Neither party pushed their weight. I wasn’t ever questioned, doubted, or put on the spot. I didn’t have to reiterate the value of working with my marketing agency or convince anyone why we were better than the next agency. I added value without expecting immediate remuneration. For the first time, maybe ever, I felt like the scales were balanced and there was an equal desire, risk, and commitment from both sides. The perfect client relationship starts with equal desire, risk, and commitment on both sides. 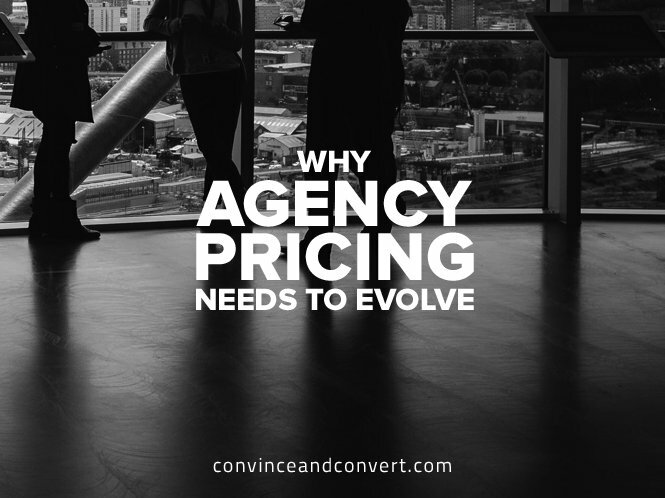 Is the traditional agency model broken? Are brands and agencies having the wrong conversations and failing from the start? In the last year, I’ve had clients end their contracts with us when we were driving tangible growth and showing unmistakable progress. With one client, we had completely changed the way their business did sales and marketing; ROI on their marketing was substantially in the positive, and inbound leads had skyrocketed. They decided to go with another, cheaper marketing agency anyway. I admit we weren’t perfect at every turn, but it still baffles me. So what made this new situation different? I was interested in the product and thought there was a bright future for the company, given the right support. This isn’t true of every opportunity. The prospect seemed to respect me and my company from the start and appreciated the line of questioning and consultative approach. This isn’t true of all prospects. The prospect was equally excited to work with us. It rarely feels this way. I brought up performance-based compensation. In the past, I would push companies away if they asked me about performance compensation. I remember a client prospect asking me about a performance marketing relationship back in 2011 before signing a contract. The risk seemed completely one-sided. Maybe I didn’t have enough knowledge of their business or confidence in our ability to perform at the level they were expecting. We went on to sign a contract, but left performance compensation out of the deal. With our help, that particular “prospect” has achieved 500+ percent revenue growth in some quarters, compared with a few years prior, and the upward trend continues. Naturally, it made me second-guess our approach. What if we had opted for a performance marketing approach back in 2011? This new conversation with the small retail client was different from the start. Unlike my previous experiences, I had complete confidence in our ability to drive growth for this company, and performance compensation intrigued me more than it worried me. I proposed a performance marketing model that included a lower monthly cash outlay for our services in exchange for a revenue share on each product sold that provided attractive upside for us. Risk would be shared by both parties, and both parties would be committed. Thinking about the potential has given me new life. This time around, I’m thinking about how we’re going to sell 100,000 products and imagining what that will do for their business, and ours. Maybe it’s that both the client and agency are focused on the value and the outcome, not the input (hourly rate). Could it be a clue that hourly billing is killing us, and the future lies in more of a hybrid model that includes some performance compensation? With performance and equity models, the agency shares in the risk and reward. In my experience, it completely changes the conversation. When you see an opportunity and you’ve found a good partner that shares your values, take a chance on yourselves. Shift the conversation away from your rates, and talk about outcomes. Find an opportunity to invest in a product or business with an upside. Don’t force it on every prospect, but begin to diversify the way your agency makes money. Even if you must take an uncomfortable risk to do so, your agency will take on an energy and excitement that you haven’t seen in awhile. It has for me, and it’s bleeding into all facets of my company. Jason is co-founder and CEO of Brolik, a digital agency in Philadelphia. As an entrepreneur, Jason is passionate about helping other business owners navigate the complicated journey of owning a business and developing marketing strategies to grow their brand.